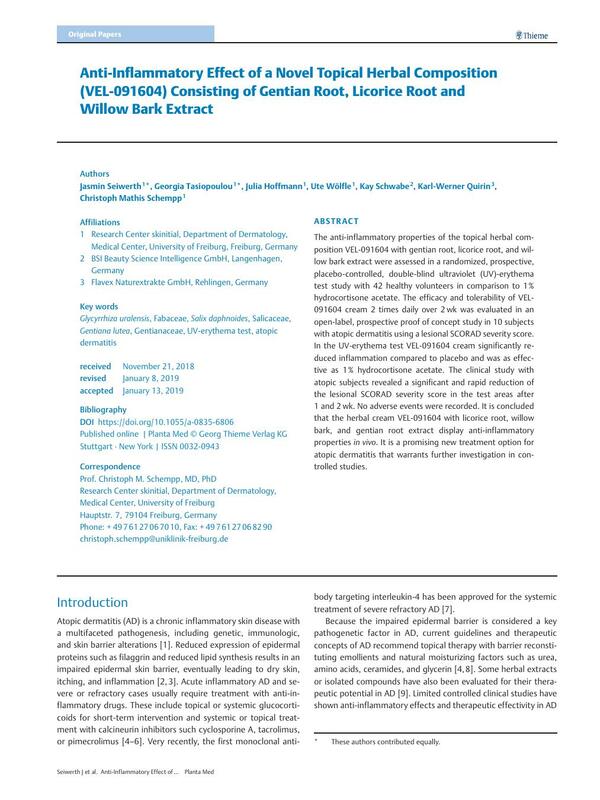 The anti-inflammatory properties of the topical herbal composition VEL-091604 with gentian root, licorice root, and willow bark extract were assessed in a randomized, prospective, placebo-controlled, double-blind ultraviolet (UV)-erythema test study with 42 healthy volunteers in comparison to 1% hydrocortisone acetate. The efficacy and tolerability of VEL-091604 cream 2 times daily over 2 wk was evaluated in an open-label, prospective proof of concept study in 10 subjects with atopic dermatitis using a lesional SCORAD severity score. In the UV-erythema test VEL-091604 cream significantly reduced inflammation compared to placebo and was as effective as 1% hydrocortisone acetate. The clinical study with atopic subjects revealed a significant and rapid reduction of the lesional SCORAD severity score in the test areas after 1 and 2 wk. No adverse events were recorded. It is concluded that the herbal cream VEL-091604 with licorice root, willow bark, and gentian root extract display anti-inflammatory properties in vivo. It is a promising new treatment option for atopic dermatitis that warrants further investigation in controlled studies.